Israel says it will impose an "aerial siege" along its border with Gaza to stop militants firing rockets from a new Israeli-declared buffer zone. Deputy Defence Minister Zeev Boim said Israel would give Palestinian police a map of the zone and drop explanatory leaflets over the area to warn people. Palestinian militants have stepped up their rocket attacks since Israel withdrew from Gaza in September. Israel's decision followed an attack on Thursday that wounded four soldiers. A Palestinian man was killed when the army responded by firing artillery shells at the launch site in a field it claimed was empty. Mr Boim told Israeli Army radio that the buffer zone would be about 2.5km (1.5 miles) deep and run along the northern and eastern edge of the Gaza Strip. "We are tightening the screw... by creating these areas, in the hope that they will get the message and that this will stop the rocket squads," he said. "If we must, we will have to tighten the screw further." The minister also revealed that the Israeli army might now begin to fire shells at populated areas of Gaza in response to an attack by rockets. "We need to tell the residents of Beit Hanoun, Beit Lahia, and the suburbs of Jabaliya: 'In 12 hours, artillery will land in the area, evacuate these areas'," he said. "I think one operation of this sort can solve the problem." Israeli officials have also discussed cutting off Gaza's electricity supply in response to rocket attacks, but army commanders and the attorney general are opposed to the collective punishment of residents. But Yuval Steinitz, the chairman of the Knesset Foreign Affairs and Defence Committee, said he would not rule it out. 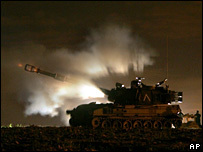 "It can't be that they fire at us from there and we provide electricity," he told Israel Radio.